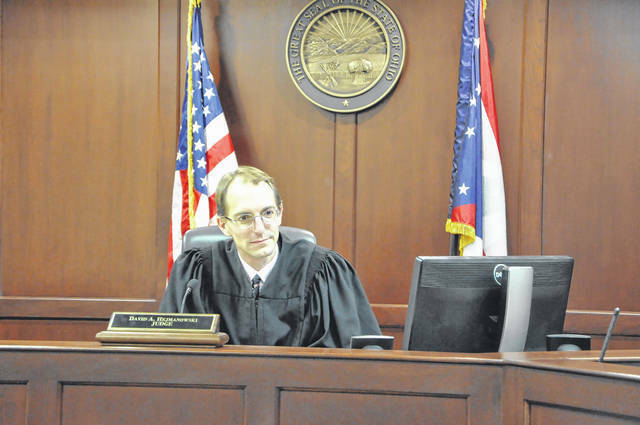 Delaware County Juvenile Court Judge David Hejmanowski, shown in his courtroom at the Hayes Building, said a grant that was recently awarded to the juvenile court will help diagnose individual needs of juveniles and keep them out of detention centers. Delaware County Juvenile and Probate Court Judge David Hejmanowski said a RECLAIM grant that was recently awarded to the juvenile court will help diagnose individual needs of juveniles and keep them out of detention centers. Competitive RECLAIM is a performance-driven grant that is designed to fund community-based programs that provide youth with the right intervention in the right environment, the juvenile court reported. The Competitive Reclaim Grant is designed to provide proven programming to youth at a moderate to high risk to re-offend, with the goal of reducing the necessity of costly out-of-home placements for these youth and reducing the likelihood that they will re-offend. The three-year grant — in the amount of $94,220 for the first year, and subsequently renewable in years two and three for a total of $272,135 — will support the training of the court’s probation staff in both Effective Practices in Community Supervision (EPICS) and The Carey Guides. EPICS and The Carey Guides are tools designed to help court personnel work with youth to effect behavioral change, reduce recidivism, and increase probation compliance. The grant will also provide additional technical assistance to the court, after the initial training, for the implementation of these models. “We know from studies that once you have placed a child in detention, the likelihood that that child will re-offend in a way that will require them to go back to detention increases significantly,” Hejmanowski said. Hejmanowski said being sent to a detention center and being “scared straight” may work for some juveniles, but he said the opposite can be true because once juveniles see what the detention center is like, they may not be scared of it and re-offend. Hejmanowski said the court’s budget for the detention center will be $650,000 next year and that if they had not started using intervention programs in the last few years the budget would probably be at least $150,000 more and would likely be close to $1 million. The court reported that earlier this month, it had hired an Intensive Family Advocate, funded by the Competitive RECLAIM grant, who will work with the families of moderate to high risk youth using the principles of Functional Family Therapy. The intensive family advocate, who has already begun serving youth and families, will meet with them in their homes to try to address family system issues that are contributing to the negative behavior of the youth and will work to build cohesion among family members.